Support for the European Union may be rebounding just in time for the European Parliament elections, according to a new survey by the Pew Research Center. But, as voters head to the polls beginning May 22, publics across Europe overwhelmingly think that their voice is not heard in Brussels, home to the EU. And concern about immigration adds to the public’s disgruntlement. 1Disillusion with the EU seems to be ending. Support for the European Union is rebounding just in time for the May 22-25 European Parliament elections. After a dramatic decline in the wake of the euro crisis, EU favorability is now on the rise in France, the United Kingdom and Germany. And faith in one of the EU’s founding principles – that European economic integration is good for their own country – is up in the UK, Poland and Germany. Median belief that European economic integration strengthens a person’s national economy is up as well, driven by a 15-point increase in the UK and a 12-point rise in Poland. However, EU support has yet to return to pre-crisis levels. Italians are increasingly critical of the institution. 2But Europeans still think the EU doesn’t listen, is out of touch, intrusive and inefficient. People across Europe overwhelmingly think that their voice is not heard in Brussels, home to the EU. Majorities in all seven countries surveyed think their voice does not count in the EU. Italians (81%) and Greeks (80%) are particularly disheartened and 71% of Germans share this sense of powerlessness. A median of 65% say the EU does not understand their needs, a median of 63% see the EU as intrusive, and a median of 57% hold the view that the EU is inefficient. 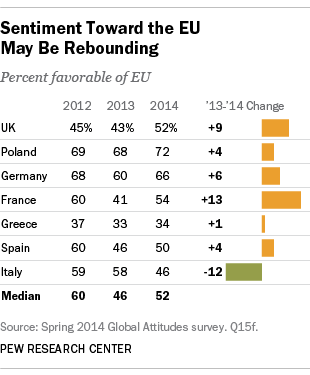 3As Europeans head to the polls, a median of just 36% percent has a favorable view of the European Parliament. 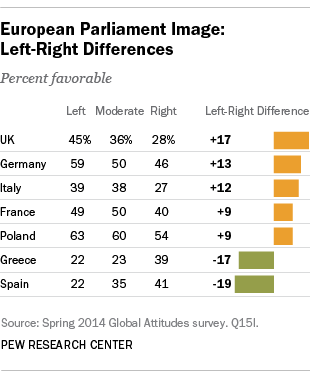 This includes particularly low regard in Greece (26%) and Spain (32%). Only in Poland does more than half the public (57%) voice a positive assessment of the Parliament. 4The Parliament vote may be driven by continued gloom about the economy. Europe is showing signs of recovering from the double-dip recession it experienced in the wake of the economic crisis in 2008. But a median of just 12% across the continent is satisfied with the state of their national economy. The proportion of the population that says the economy is faring well is in single digits in Greece (2%), Italy (3%) and Spain (8%). Germans are the most upbeat, with 85% saying their economy is performing fine. 5Attitudes toward immigrants and minority groups will also shape the public mood in the run up to the parliamentary election. A median of 55% wants to limit immigration. This includes particularly strong anti-immigrant sentiment in Greece (86%) and Italy (80%). A median of 52% in European countries we surveyed say immigrants are a burden because they take jobs and social benefits, 48% complain they want to be distinct from the local society, and 36% say they are to blame for crime. Views of minorities vary widely, both between countries and about specific minority populations (Roma, Muslims and Jews). Negative sentiments about all three groups are consistently more common among people on the ideological right.